The Samsung Galaxy Note 7 battery fires and explosions that – quite literally –sparked two recalls and cost the smartphone maker at least $5 billion have finally been solved, according to Samsung. "We are taking responsibility," said the company's mobile President DJ Koh after a four-month-long investigation that came to a head today, during a press conference in Seoul, South Korea. The reason behind the Note 7 fires comes down to irregularly sized batteries, which caused the overheating, as well as other manufacturing problems in a second round of replacement batteries that were rushed out. Samsung sealed a sizable 3,500mAh lithium-ion battery into a 7.9mm thin smartphone, but half of the Note 7 batteries were made by its subsidiary Samsung SDI and didn’t properly fit into the Android phone. The subsequent overheating caused the first round of battery explosions and fires throughout August and September, and a handful of the incidents were caught on video or in photos. Short on time? Check out our video for the key points and whether we think Samsung has done enough to win back consumers. 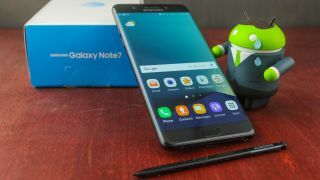 Samsung recalled and reissued all Galaxy Note 7 phones in September, thinking that the other half of its phones – the ones with batteries made by affiliate Amperex Technology – were fine. However, the sudden ramp up in the second batch of Samsung Galaxy Note 7 phones seems to have caused a number of different manufacturing issues. At Samsung's press conference, the company said that there could have been a number of failures during this rushed process, with contributing factors including missing insulation tape and sharp edge protrusions. Issue: The negative electrode was deflected in the upper-right corner of the battery. Issue: High welding burrs on the positive electrode resulted in the penetration of the insulation tape and separator which then caused direct contact between the positive tab with the negative electrode. The one-two punch of production errors caused Samsung to issue another recall and ultimately cancel its popular, S-Pen toting smartphone, leaving billions of dollars on the table in the process. Samsung says that 96% of the 3 million Galaxy Note 7 phones sold have been returned worldwide, but US carrier Verizon said that ‘thousands’ of its customers are still holding onto the phone on its network. More than money, Samsung’s reputation as the top Android phone maker has been damaged. The Note 7 is now banned on airplanes and, for several months, there was a PR-devastating flight announcement about the ban before every US plane took off. All of this is will hurt the Samsung brand going forward, as it plans to launch new phones. The Samsung Galaxy S8 will be its new flagship handset for 2017, and it looks set to arrive in March/April this year. In short, it’s coming soon and part of Samsung’s press conference was to reassure the public that safety is (now) its top priority. It's taking "several corrective actions to ensure this never happens again," the company said today in a statement issued to TechRadar and the media. But will today’s admission coupled with a (hopefully) superior Galaxy S8 be enough to keep people from switching to the iPhone 8, LG G6 or HTC 11? Only time will tell, and it will come down to whether people are happy to take Samsung's word that its batteries will indeed be safe in future devices. Don’t iPhones catch on fire too? This is the first line of defense from Samsung’s still-loyal (slightly smaller) base, and it’s what we would call mostly false for a few simple reasons. It’s true, there have been reports of iPhones exploding over the years, but they are spread out; too few and far between. It’s not enough for a recall, but it’s enough to get everyone nervous. There’s an important lesson for all smartphone owners in almost all of these iPhone explosion horror stories: they often involve using faulty third-party chargers, meaning it’s never been determined to be an internal battery issue. Will there be a Samsung Galaxy Note 8? Samsung went on record soon after the Note 7 issues last year to say it plans to launch a Samsung Galaxy Note 8 in 2017 - which may surprise some readers. It's been much quieter about a potential Note 8 launch since October 2016 though, with no further confirmation of a next generation phablet during its Note 7 press conference. Looking at the wider picture though it makes sense. The Note 7 problems were isolated to just that handset - the Galaxy S7 is fine, as was its predecessor the Galaxy Note 5. There's no question that Samsung's phablet line has taken a serious knock, but there's still demand for a premium big-screened smartphone and the South Korean firm makes some of the best around. The biggest beneficiaries of the Galaxy Note 7 recall are Apple, Google and LG, and all of them have smartphones that compete with Samsung flagship devices. iPhone 7 Plus is Apple’s phone that comes closest comparing to the Note 7 due to its 5.5-inch display. You can actually walk away with some extra cash and a free iPhone if you have a Note 7. While Samsung has offered the Galaxy S7 Edge and $100 as a replacement for its recalled phone, it has also been willing to exchange the troubled phone for an iPhone 7 Plus and still pay [former] customers $25. Ouch. Google launched the Google Pixel and Google Pixel XL running its latest Android 7.0 Nougat software and compatible with the Google Daydream View VR headset. The fact that Google is taking a bigger role in hardware (and not just Android software) is just as much a threat to Samsung as Apple has been. Finally, the LG G6 is the next big Android smartphone that’s expected to be announced next month at MWC 2017 in Barcelona. It’s said to completely different from the LG G5 (that's good news for everyone) and include an extra-wide screen with an aspect ratio of 18x9. Samsung's comeback story really gets underway with the Galaxy S8 launch, but today's press conference needed to happen first to reassure phone buyers that it's safe to upgrade to the next phone. Now it just needs to explain its Samsung washing machine explosions and we're all set.